I love fall – the clothes, the smells, the beautiful landscape… Everything except the cold temperatures! The arrival of fall also means it’s apple season, and that means lots of yummy apple treats! 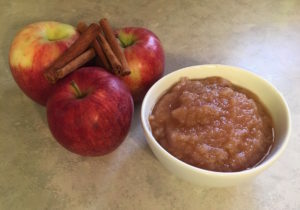 One of our family’s favorites is homemade applesauce. For several years I avoided making homemade applesauce because ugh. all that peeling! Our favorites for applesauce have been Jonagold & Pink Lady. There are two methods that I have found, and I’ve tried both. Method 2, which uses a Foley food mill, produces a much finer applesauce, similar to what you would find in the store (but way better!). We prefer Method 1 because we like chunky applesauce! Use an Apple Peeler/Corer to peel and core your apples. Put the apples in your slow cooker. Mash (a potato masher works well) until desired consistency, or use an immersion blender to get really smooth applesauce. Cut apples into slices, about 1/2” or so. 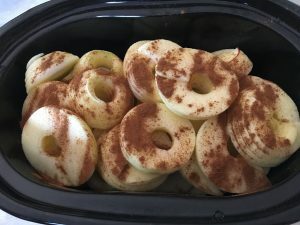 Pull all apple slices in the slow cooker. Run apples through a Foley Food Mill . It is seriously that easy! No endless peeling and chopping. No stovetop cooking. No watching the pots. Just throw ‘em in and go! Voila! 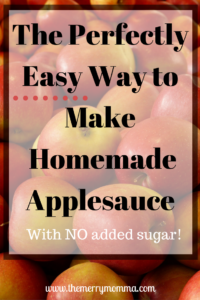 Easy, simple, DELICIOUS applesauce with NO added sugar!! Of course, you only save yourself the endless peeling and chopping if you get an Apple Peeler/Corer or a Foley Food Mill . However, I HIGHLY recommend you get either one … or both! If you have to choose, I would go with the apple peeler. I LOVE mine. If you do a lot of cooking with apples in the fall (applesauce, apple crisp, apple bread … mmmmm), you should definitely invest in one. It will save you so much time, energy, and pain in your hands! Thanks for reading, and enjoy those apple harvests! As always, feel free to share with your friends! I’m sure you know plenty of busy moms who would love this tip! Peel/core/slice apples – 10 minutes, tops, with my apple peeler/slicer. Set the pot to MANUAL for 8 minutes. Yeah … 8 MINUTES!!! Smash it up a little & enjoy! From start to finish, I can make homemade applesauce in about 30 minutes. Maybe 45, depending on how long it takes to reach pressure. How easy is that??? I love apple season. We always make applesauce in our crockpot. The apple/corer/peeler/slicer is a life saver. When I’m feeling adventurous we add mangos and cranberries. The kids love the change in flavor. And there really is no reason to add sugar. Our favorite apples are Honey Crisp, but there is never enough left to make anything from it because my children devour them. I’ll have to try honeycrisp next time. I’ve had fun experimenting with different kinds of apples and trying out their different flavors. I love the idea of putting other fruits in there – I have never tried that! Woah! I didn’t think it was that easy. And I love that you don’t add any sugar. I’m excited to try it this weekend. Thanks for sharing! It is SO easy! I love the no sugar part of it, too. If you choose a good apple, the natural sugars make it plenty sweet! Thanks for sharing this recipe! It looks like something my son would love! I need to try this. I love apple sauce. Great post. Thanks. You should! It’s SO simple, but so yummy! This is pretty much the method I used (discovered it last year), and I LOVE making applesauce in the crock pot. It makes life SO much easier. And, I have that same peeler/corer thingy, too, and it’s one of my favorite random kitchen tools. I had one growing up and it it was always fun as a kid to get to turn the handle and watch the apple skins magically come off (and then eat the REALLY long strings of peel). Fun times. Yay thanks for this! My family received a HUGE bag of apples so I’ve been on a Pinterest search for an easy applesauce I can make. Definitely trying this! Woo-hoo, glad I could help! Enjoy your applesauce! This is great. I can’t wait to try to make my own applesauce. I am glad you left the link to the guide to the type of apples to use because that is always the part I get wrong! It does make a difference! Glad I could help! This is awesome. I may actually make applesauce now!! ? I’ve always loved homemade applesauce but never even dreamed of making it myself because…..who has time for that?! ? That’s exactly what I always thought! Definitely give it a go in the crockpot. Just dump in the apples and walk away! Come back 3 hours later to delicious applesauce!